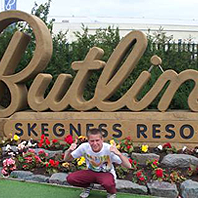 One of the first students to complete Derby College’s Diploma in Travel and Tourism, Luke Orme landed his dream job as a Butlins Redcoat at the popular Skegness Holiday Resort. Inspired to apply after seeing Redcoats in action on his own holidays, Luke says that the insights he gained into the industry at College gave him the edge over other applicants at the Butlins interview and audition. Find out about Travel & Tourism studying at Derby College.